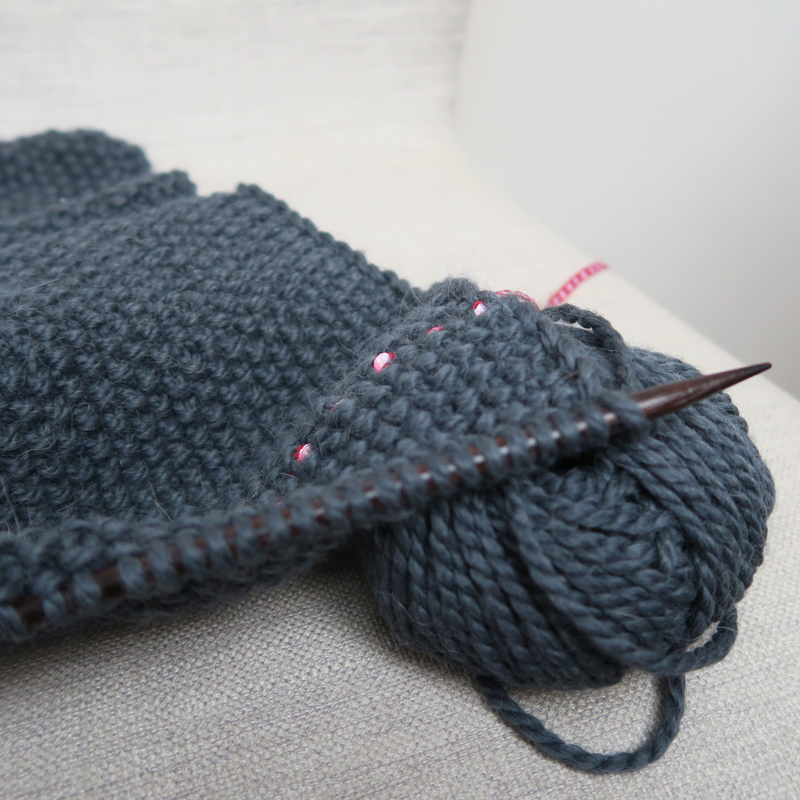 Anyone who has followed this blog over the last decade may recall that my knitting forays have never actually resulted in a finished garment (at least working on the basis that, unless trying to emulate Michael Jackson's one-handed glove wearing, one really requires two gloves to avoid looking like curious creature). It's come as a source of delight and surprise to have not only finished something, but to have commenced a second project! When my daughter visited the Christmas markets in Germany the year before last, she brought back a beautiful snood for just a few euros. Every time she's put it on since, she's chastised herself for not buying another one in a different colour, so when I was pondering her Christmas gifts this year I decided to buy a kit from Wool and the Gang so that she could make one for herself. Wool and the Gang's branding is so youthful and stylish that I felt confident that one of their kits may be enough to lure her woolwards. (And in a fit of self-gifting, I bought a navy kit for myself, so that we might sit and knit companionably. What a wonderful rabbit hole that proved to be). We both used this kit - her kit used Margaux Red, while mine contained Midnight Navy yarn. One day over Christmas we pulled out our large balls of wool and began. The wool was vast and our friend, Ben, enquired whether we were using special 'training needles', such was their girth. I guess we were, although I think they're standard for any kind of 'big wool' knitting perhaps. We followed the WATG slip knot tutorial; long-tail cast-on video; then the moss-stitch instructions and then we were actually moss-stitching. 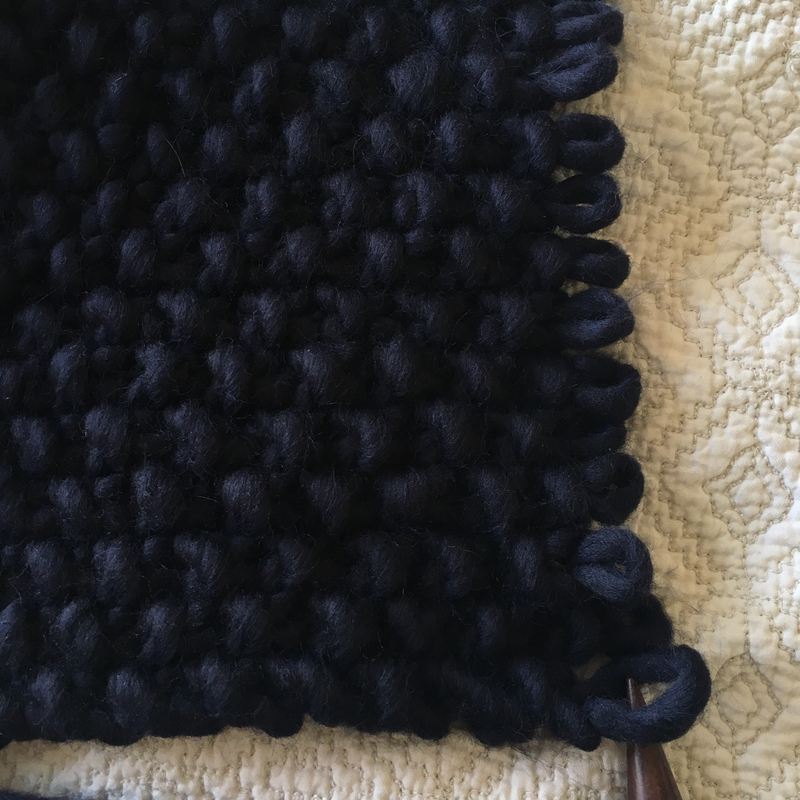 The first few rows looked unimpressive and odd, but several rows in, the bumps began to look like a recognisably repeating textural pattern. The pattern included in the kit contained little helpful information for a beginner, so I think the intention is that you supplement it with their videos, which are are wonderfully clear and the way that they're shot makes them feel oddly calming to watch. We later also discovered the Top 10 Knitting Tips video, which I wish I'd watched first as it's really useful. 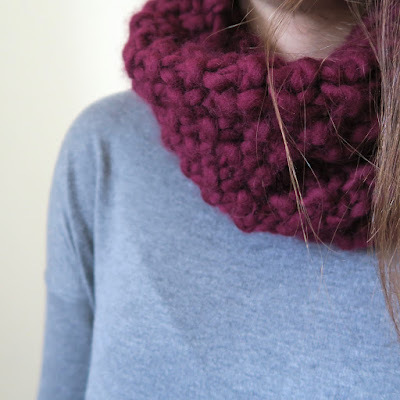 One day, we took our knitting over to my parents house and while my sister and mum cooked lunch, my grandmother and I sat and took it in turns to knit a row each on my snood. My grandmother was always a wonderful knitter, but it's a few years since she's picked up some needles and she'd forgotten some of what she once knew. Despite the intense concentration, her face looked so relaxed and happy when knitting again. She mostly always looks happy (she is one of the most sparkly and vivacious people I know) but this was a different kind of happiness; I imagine it's exactly the way I'd look if I was handed some English paper piecing in my late 80s. Whenever it was my turn, she made such genuinely delighted comments of admiration and encouragement that I was cast back to how it felt to be taught something by her as a child - she always had an amazing capacity to teach in a way that never made me feel stupid or aware of her impatience, if she actually felt any. Every time my daughter and I dropped a stitch, we pulled back all of our knitting and would start again, as neither of us had any idea of how to remedy our mistakes. We didn't really mind this as we were both enjoying the process of perfecting our stitches. 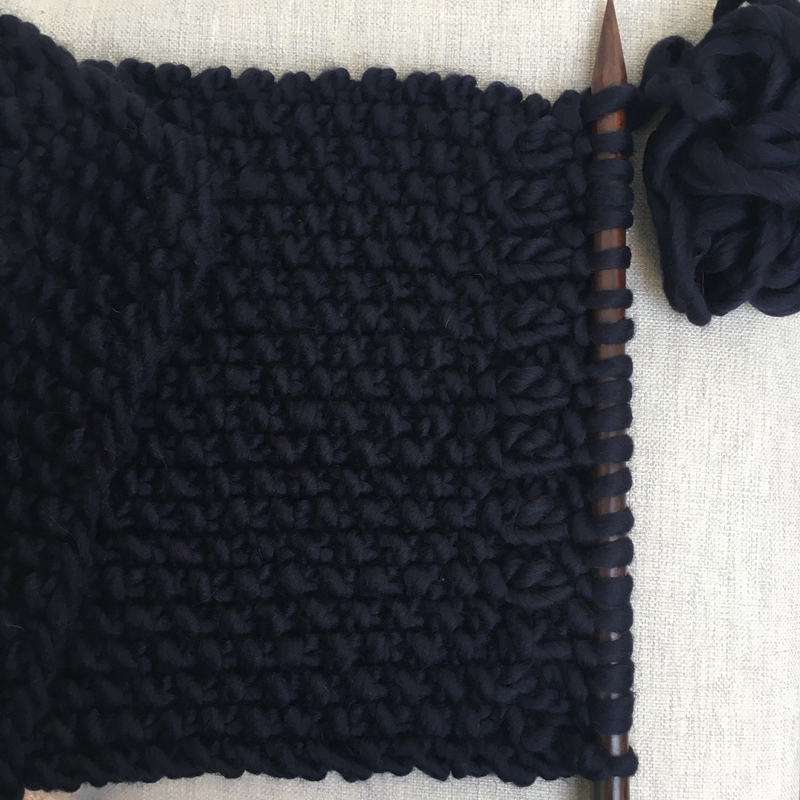 Each time we started afresh we made less and less mistakes and on my fifth attempt I had nearly finished my snood, when I realised that I'd done my knit and purls in the wrong order. So close to having a wearable garment, I suddenly did feel quite distressed by this. I took to the internet and posted the above photo...and later the below photo...and found out bit by bit how to fix it. It's been a while since I was dabbling in an area of craft where I'm a complete beginner, and it was lovely to be reminded anew of just how generous and warm people are in sharing their knowledge - me and my ailing knitting were so kindly shepherded back to a place of hole-free rows of moss stitch! In the situation above, the piece of advice that seemed to ring clearest to me, was to lay all the stitches flat like 'n's and then to make sure the right hand side of the stitch was on my side of the needle, rotating the stitches 45 degrees. And also that the tail of yarn should end up at the top of the needle. 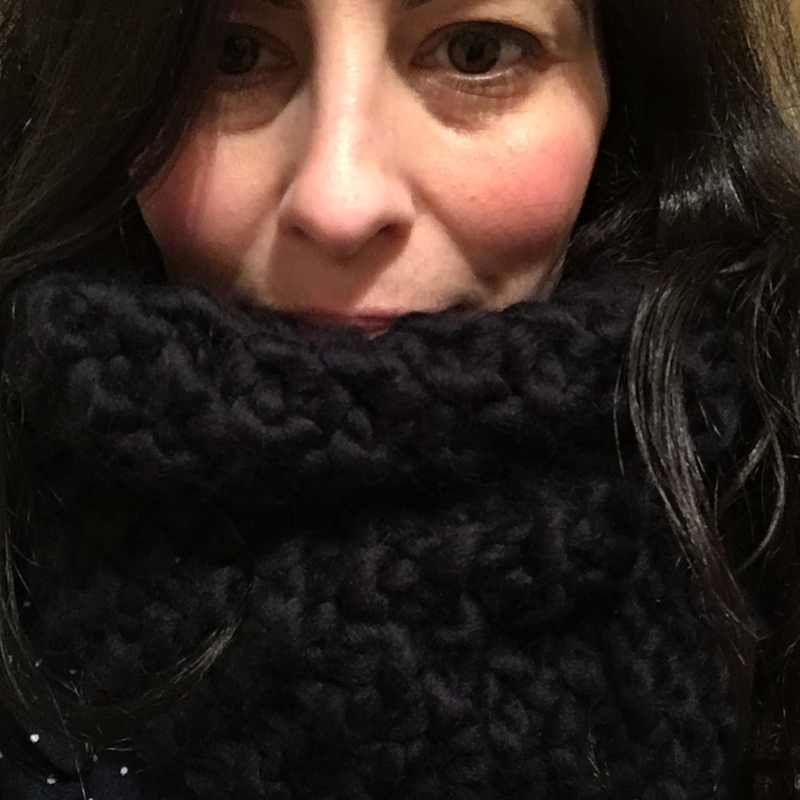 We've worn our snoods almost constantly and they are deliciously warm and cosy - thicker and warmer than anything else I own. Sadly, my daughter lost hers on a school trip to the Tate Modern last week, so I've ordered some more wool for her so that she can remake it. I think what worked for us about these kits was that the huge wool meant that it was very quick to knit quite a large area, giving us a sense of instant gratification. Also, mentally, the fact that my kit came with everything I needed in it, made me feel more confident that I had the right size needles for my wool. I'm doing a lot of sewing for various deadlines at the moment, but I so enjoyed making my snood over Christmas that I didn't feel quite ready to put knitting on hold entirely, so I bought a Joni Kit and I'm limiting myself to just doing ten minutes early in the morning or last thing at night. My husband thinks that taking a break from my sewing by doing more handiwork is a very curious thing indeed, but somehow this time feels like a complete break and is both reviving and relaxing. And it grows so quickly! I chose the Joni scarf, because it uses the same moss stitch that I was already used to, but with much finer wool and narrower needles, so it felt like a fresh challenge. I also hadn't bothered to find out what 'slipping a stitch' at the start of each row involved for my snood, but decided that I'd learn how to do that (so incredibly simple that it barely warrants the word 'learn'!) and so this time I have a lovely smooth edge to my knitting. 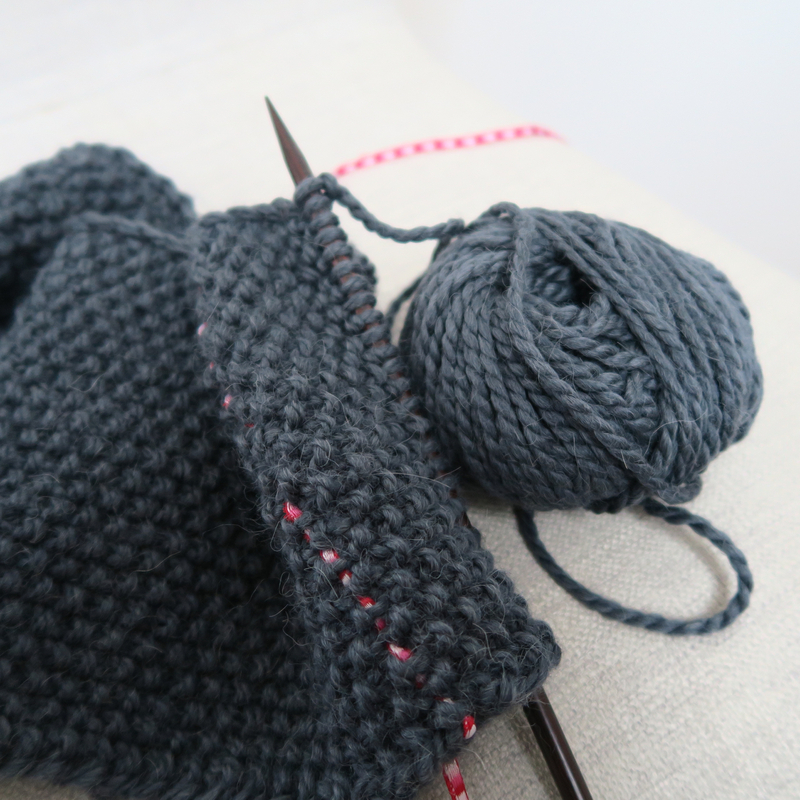 The wool for my Joni scarf is wonderfully soft and this bluey-grey is one of my favourite colours to wear, so I'm looking forward to finishing it. When I ran into problems on my last project, several people suggested using a 'lifeline' so that if I wasn't able to correct a mistake, I'd only ever have to pull my knitting back to the lifeline. This was such good advice. I've repositioned the lifeline every ten rows or so and I've now made use of it once and can affirm that it works like a dream! For the uninitiated, just use a big embroidery needle to run a line of thick thread (or in my case, slim ribbon) through the stitches currently on the needle. This then saves those stitches from unravelling if you need to pull it back later. It's not always the easiest of things knitting the first line of stitches following inserting the lifeline as it's a job to avoid it becoming entangled in the stitches, but other than that it's very simple and works wonderfully (there's a clearer photo at the top of this post). I have a few questions that I wondered if knitters might be able to help me with. The WATG video tutorials are amazing, but I also always really love having a book to refer to. Maddeningly, I was sent this beautiful book several years ago, but despite having looked on every shelf, I can't find it anywhere. I'm wondering whether to re-buy it, although I think what I'd also really like a book that contains a big library of stitches, as I feel quite fascinated by all the different textures that can be created. As the book is likely to be more for inspiration, rather than practical use (if I find a stitch I like, I'd possibly look for a video on how to do it), I'd really like a book where the emphasis is on it being gorgeous (which Erika Knight's books do seem to be). My local bookshop seems to stock far more sewing than knitting books and I'm finding it difficult to pick on online - do you have any recommendations? Also, I have become quite obsessed by the idea of creating mittens that look a bit like these thrummed mittens - I love those tiny little 'v' shapes. I wonder though, is there a way of getting the same finish with less bulk inside? And if so, what's it called? I often keep gloves in my handbag and so prefer slimline ones. And would this be running, when one can barely walk? Thank you in advance if you're able to give any advice. Looking up at the date on the top corner of my laptop today and finding myself already on 17th January makes me feel that the year has got off to a galloping start. I hope the first days of 2017 have been good ones for you! Over the last few weeks I've been struggling to find quite the right background fabric for the central medallion of a quilt that I've been working on recently. My husband was stumped by it too so, following an SOS call (in which I dramatically doubted the rightness of every single thing about the entire quilt), my parents came over to help me. They both have a brilliant eye for colour and seem to have a natural understanding of how quilts come together - my father commenting at one point: 'the background fabric here is really a transitional area that needs to create a link between the medallion and the outer parts of the quilt'. At which point we stopped briefly to commend him on his brilliant likeness to a Quilt God. They then went on to assess each option I'd laid out, carefully rummaged through my fabric drawers looking for alternatives and together we narrowed things down to come up with an idea of the kinds of fabrics that could potentially work and even came up with some extra details that I could add in. And gradually I felt my equilibrium being restored. Even though I was frustrated by my own inability to initially see what was needed, it was a really lovely morning and one that left me feeling acutely aware of how incredibly lucky I am to have these two wonderful creatures in my life. After they'd left, I quickly trawled some online quilt shops looking for things that met the criteria we'd laid out, before dashing out with my husband to walk Nell and buy a celebratory brownie from our local cafe. I so often only buy prints that I've either fallen in love with or which will work well for fussy-cutting, that I'm frequently lacking in essential blender prints, so this little stack that arrived today has left me feeling better-stocked with options. Most of the ones above are either from Sew Hot Fabrics or The Fabric Fox, both of which are quite regular haunts for me. In other news, yesterday, Fiona (of The Sewing Directory), launched a new website and it's one that I've been silently wishing for, for a long time. 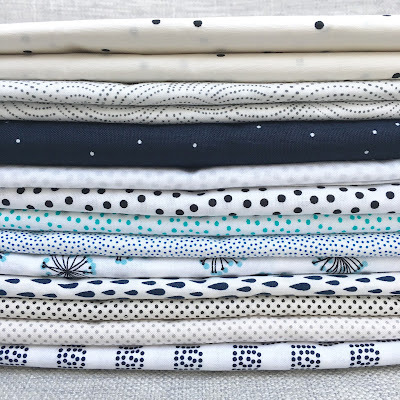 Several years ago, there was an amazing site that used to share many of the latest fabric launches - I can't remember what it was called now, but I always loved it and found it a really useful resource whenever I was planning a quilt. Sadly, the woman who wrote it passed it on to someone else when she had a career change and I think the site's focus changed at that point and it eventually petered out - does anyone remember it? 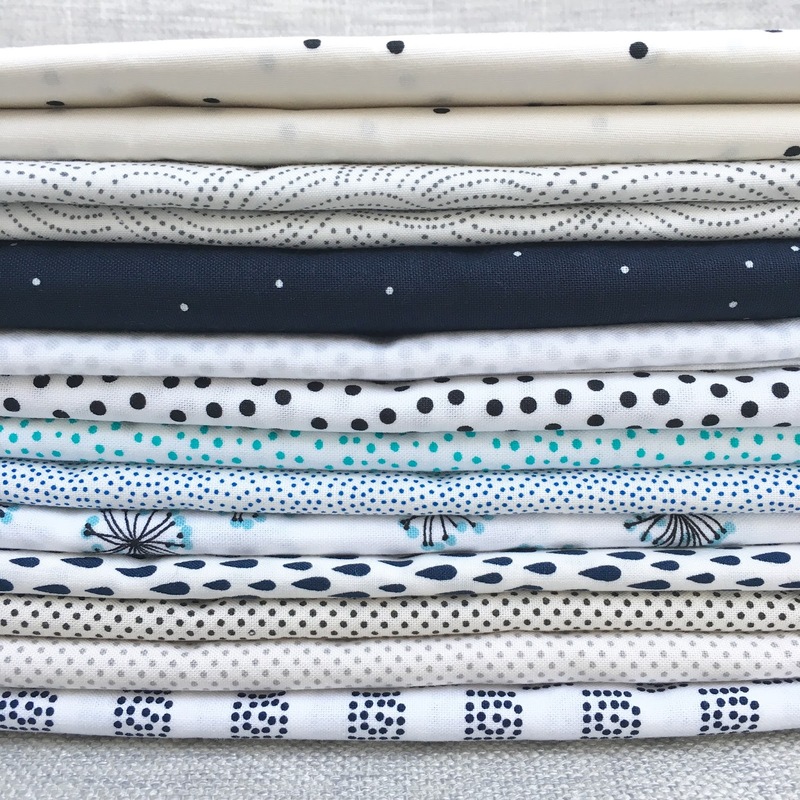 Anyway, Fiona's new site, Forever Fabric, is basically just like that original site, but with the added advantage of also telling you where each fabric range is being stocked in the UK and the US. There seem to be a lot more modern fabric collections than there were a decade ago, so it will be lovely to find them all in one place as I often find that if I'm late in discovering a line that I love, by that point many of the prints have already sold out (and by late, I mean about 18 months late, causing me to wonder if I've been wearing a blindfold).